Sometimes my food blog is also my touch stone. Do you ever have those times when work and life's details feel like too much batter for one tiny bowl? It's been one of those weeks for me. Now, as my pages of TO-DO lists look a little more TO-DOable, I can sit and focus on the art of food. As the winner of last month's Paper Chef (chosen by the talented Fiona of Nice Profiteroles), it is up to me to pick from the lovely entrants on this Paper Chef #53 Roundup. Pauline with a Flammekueche and mushroom soup Flammekueche and mushroom soup NOW THE IMPORTANT THING: The Winner: You can imagine how hard the choosing is when all these recipes sound so good and the pictures make me hungry in a thousand different ways. The Terrine is both gorgeous and company-friendly. 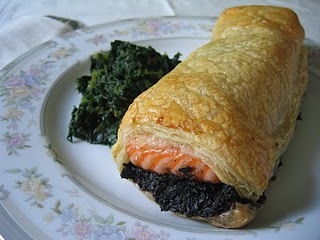 The pastry encased Salmon sounds and looks so flaky and tender and satisfying. 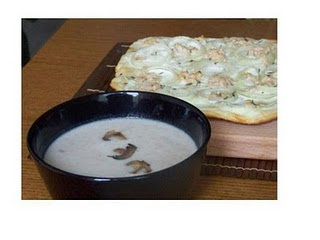 The Flammekueche sounds so unique with the Salmon addition and Mushroom soup is a favorite of mine. 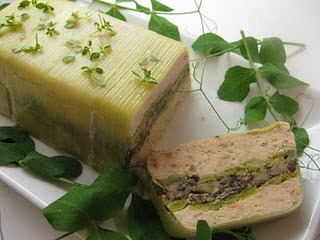 Since there MUST be a solo winner: I choose the Salmon Terrine by Karen. I'm a sucker for seasonal cooking, and the idea of a nice chilled luncheon dish on a hot summer day got the best of me. Congrats to all of you, every one of these recipes are in my files and I can' t wait to share them. Check back with Paper Chef for next month's ingredients and ask a friend to join, it's loads of fun. Place Salmon on several layers of plastic wrap. Create a paste with remaining ingredients. Rub Salmon with paste all over and pressing gently to reach creases in the Salmon. Lay any sprigs of fresh dill on top of Salmon. Wrap the Salmon in the plastic and place in small pan. Place the pan of Salmon inside a larger pan, and lay large cans or a small cooking brick on top of Salmon to help press out moisture. Remove Salmon and wash off the brining. Carve Salmon on the diagonal in strips as thin as desired for serving. *Combine these into a blender and puree til creamy. *Stir to form a paste. Whip 1 egg white to soft peaks. *Fold whipped egg white into the mushroom paste mixture til fully incorporated. *In a skillet with drizzle of oil and heated to Med/High, drop little circles of batter (about 2 inches diameter) and cook like pancakes; when browned on one side, flip and cook for a moment to brown on other side. *Remove to a warm plate to hold. *Serve: Blini can be warm or room temp. and topped with a dollop of sour cream, a small sliver of Salmon and garnished with dill or thyme. Ooooo look at how pretty those are. I just want to reach into my computer and take one. I almost just licked the screen they looked so pretty and yummy. I like your pretty pictures! And the pictures of food, too! Blini recipe worked well, although I couldn't taste much mushroom at all...:/ I subbed the flour for gluten free (Ahern AP blend) and it worked perfectly. Did you squeeze excess moisture out of the mushrooms before pureeing them? I found my batter pre-white to be quite thin, rather than a paste...added a bit of extra flour to compensate. Served them with sour cream and house cured salmon done in coriander, black peppercorn and orange juice, they were quite popular. :) Thanks!